We aren't quite sure who will be taking the punishing, but Olympia has stuck hard with their new mesh suit. The hawkishly named Olympia Avenger One Piece Mesh Suit fills a niche that has virtually no competition. There is no substantial opponent in the mesh suit category so Olympia takes this one by storm. Aggressively tailored to befit the commuter, the Olympia Avenger Mesh Suit is constructed with 500D Cordura and ballistic airflow nylon mesh panels. For the summer months, there isn't a more convenient option for staying cool. 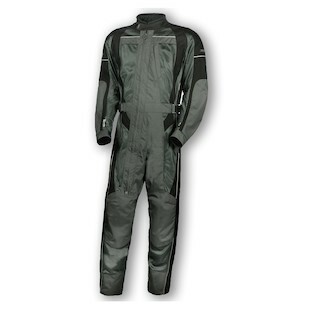 High leg-zips and a low main entry zipper make it a breeze to put on even while wearing boots. In essence, this is the one piece version of the Renegade Jacket and Pants from Olympia, however, the price point makes it a bargain over buying the pieces separately. Three storage pockets and an interior cell phone pocket all you to stash your essentials without the need for an extra bag or compartment. A custom fit is achieved by operating the adjusters at the collar, cuffs, elbows and waist. 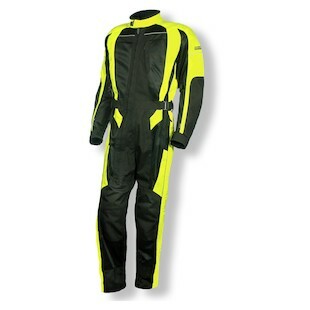 In addition to the Black/Pewter a High-Viz/Black option will scream attention from the cagers. Between the Avenger and the Odyssey, one could easily face most any riding condition without the need for another jacket or pant.